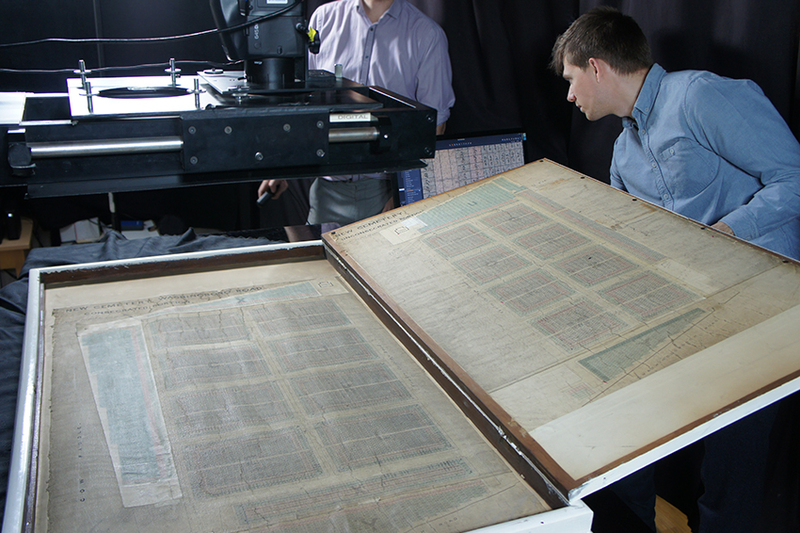 When digitising oversize archival items – such as maps, architectural plans, posters, registers and artworks – the challenges can be as unique and expansive as the items themselves. The sheer size of large format items can make them prone to damage if not handled and supported correctly, and can make capturing high quality images a challenge for those that haven’t digitised these types of materials before. For the purposes of this post by oversize or large format we generally mean items that are sized greater than A3 or 297×420 mm when fully opened, and this can include documents sized up to A0+ (over 1500 x 1500 mm). So to help you if you’re considering digitising an oversize collection, we’ve combined our in house expertise and years of experience to share our top tips for digitising large format archives below. In an ideal world large items like maps, artworks and posters would be stored open and flat. However limited archive space and storage resources often mean they are stored rolled, folded or bundled. Whilst this in itself isn’t necessarily harmful, sometimes (depending on their age and condition) unrolling/unfolding the items and immediately spreading them flat to digitise them can put the items at risk of damage. To mitigate this risk, we recommend ‘relaxing’ the items first. This means allowing rolled items to be unfurled or unfolded gradually and allowed to rest naturally for 6-12 hours in advance of being digitised. This places less stress on the material and reduces the risk of any damage being caused during the scanning process. Archival standard weights can be used once the item has been relaxed and unfurled to hold it flat for scanning. 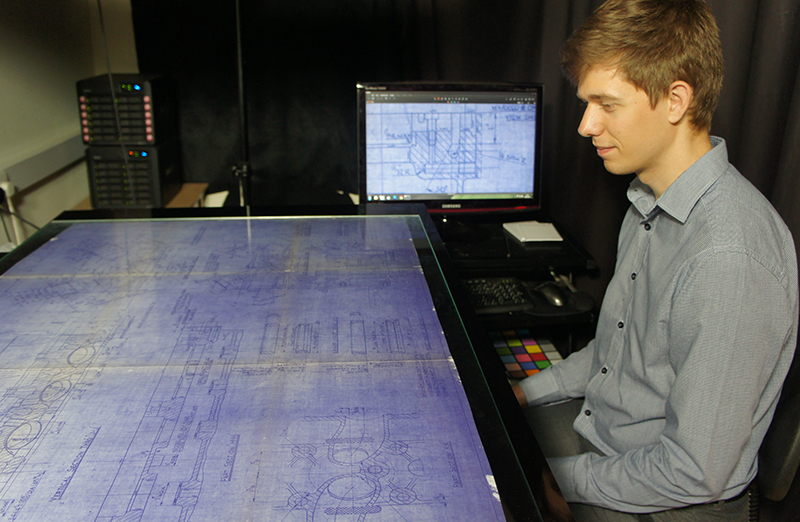 Owing to the scale of large format items and that they are often composed of fragile materials such as paper, vellum or parchment – specialist scanning equipment is essential to safely digitise them. It is vital that the scanner includes a flat, large format scanning bed that completely supports the item being digitised, in order to mitigate the risk of any tears or other minor damage. A large format book rest may also be necessary for oversize registers, which may be too fragile to open fully. An overhead camera and lighting set up is also essential, in order to allow the camera lens to be positioned a suitable distance from the object to capture it fully at an appropriate resolution. Setting up a professional standard rig complete with the correct support, non-heat producing lighting, and DSLR camera setup can cost up to £30,000. So it may not be financially feasible to purchase this equipment, making outsourcing the scanning to a third party digitisation provider often a more realistic option. If your collection is organised by size before you begin digitisation, your workflow will be far more efficient. This is because the time taken to readjust the camera setup, for instance the height of the camera from the item and the calibration of colour capture (More on this later). Our production team can testify that failure to organise collections by size can add on considerable time (and costs) to the digitisation project. The size of large items makes them difficult to handle individually. Trying to handle a large map or poster alone can put stress on the item and potentially cause damage. Of course there is also the risk of damage to the individual, framed artworks and burial registers can be very heavy and dangerous to attempt to move alone. So we always recommend working in pairs. Framed artworks pose a unique risk, and should always be held at the strongest part of the frame. Ideally if possible, oversized items should be stored flat, not overhanging shelves or protruding into areas where they may be damaged. Large items are prone to damage when not supported correctly – so the item must always be placed on a surface as large as or larger than itself to be digitised. 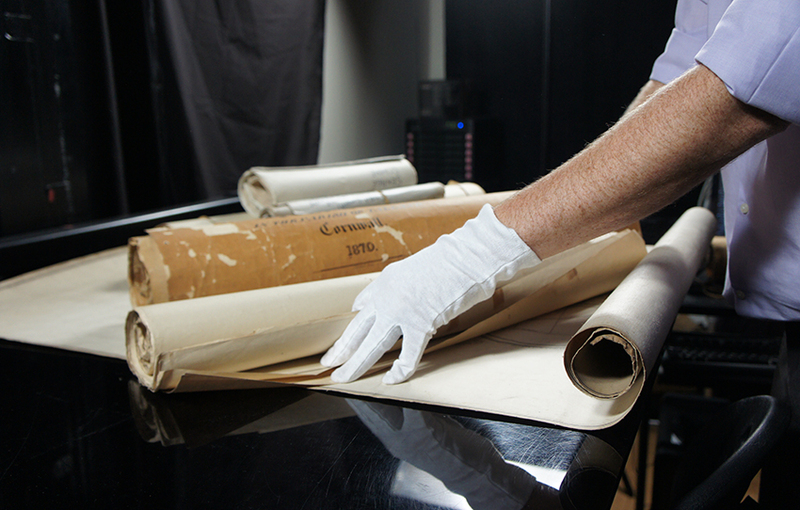 The material itself may differ also, from paper to canvas, so always make sure to follow correct handling procedure, and if in doubt consult the National Archives handling guidelines and always comply with professional equipment standards. National Archives Guidelines also recommend checking any item for mould or uncleanliness before digitisation. For example, when handling paper maps and plans; make sure hands are clean and dry, and while cotton or nitrile gloves are suitable for single sheets, we generally advise handling without gloves to preserve dexterity and minimise risk of damage. Another common material of large items, especially artworks, is canvas. When handling canvas, white cotton gloves are essential because of the damage oils on the skin can inflict. Efforts should be taken regardless, to avoid direct contact with the painted surface as much as possible. As mentioned previously large items may be framed with a glass covering. Ideally this should be removed prior to digitisation, since glass can result in glare and poor image quality. However, depending on the fragility and size of the item, this is not always possible – in these cases adjusting your lighting setup correctly can reduce glare to an acceptable level. Accurate colour capture is a must when producing digital copies of archival items. The aim being to always finish with a product as close to the physical original as possible. Since large format items are often colour keyed maps and artworks, ensuring correct colour capture takes on even greater importance. 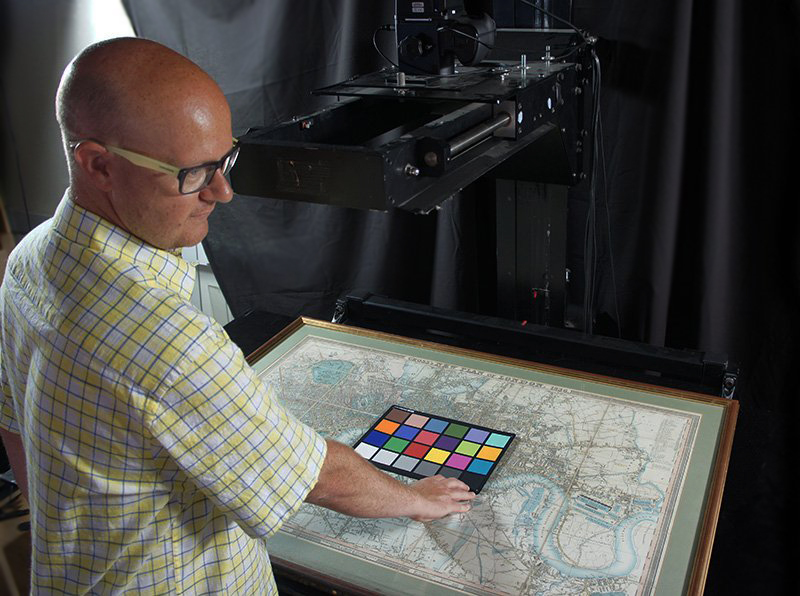 Using a colour key (pictured) to manually calibrate scanning equipment and monitors at the beginning of each batch allows for more accurate colour capture. 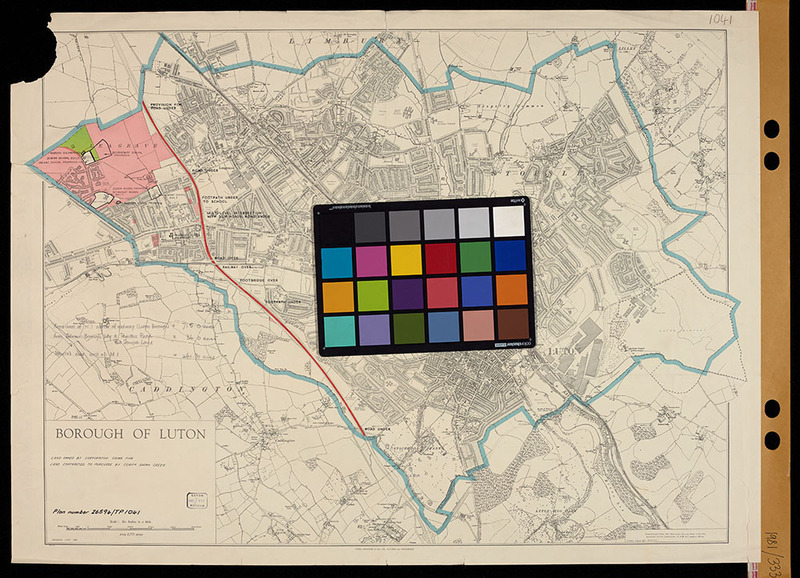 Pictured: Large Format Map courtesy of Luton Culture. In our experience, capturing images at 200ppi (pixels per inch) resolution at actual size is suitable for most oversize items. However if you require deep-zooming ability and a very high level of detail, then 300ppi is recommended. It is worth noting though that (depending on item size) this may require imaging the item in sections and digitally stitching the images together in post-production. With regards to image formats, we recommend capturing to uncompressed RGB TIFF images as a master copy for preservation. Surrogate images in different formats can then be produced from this as required. For instance, smaller JPEG images if you plan on publishing the collection to be browsed online. “A digitisation project stands or falls on its metadata” – César Merchán-Hamann of the Bodleian Library, Religious Archives Group conference 2016. Of course, one of the virtues of digitising large format items is the increased accessibility and discoverability this affords them. But comprehensive metadata is vital in enabling this accessibility, and allowing staff and researchers to find the digital records they are looking for. The metadata collected must be appropriately tailored to the goals of your digitisation project and the context of the collection. For example if you are digitising a collection of artworks, the most useful metadata fields may be the artists name, date the piece was created, title of the piece, and medium. Whereas for a large burial register names of the interred, plot location, date of interment, and cemetery name might be the most appropriate. Again, planning which metadata to capture prior to digitisation will save time and make your workflow more efficient and productive. A handy guide to metadata planning and quality control from Digital Repositories Ireland can be found here. Are you looking to digitise oversized archive material?